activities and preferences. A CRM system will help you boost your bottom-line with your current customer base; reach out to prospects; and, to predict future customer activity both individually and as a group or demographic. Continuously improving your CRM solution on a regular basis will keep you in tune with all three of these customer targets. Further, automating your customer facing business processes will increase your effectiveness and free resources that you can use elsewhere in your business. Allowing your processes to stagnate will create the opposite effect. Therefore, continuous optimization is key to your company’s profits now and in the future. 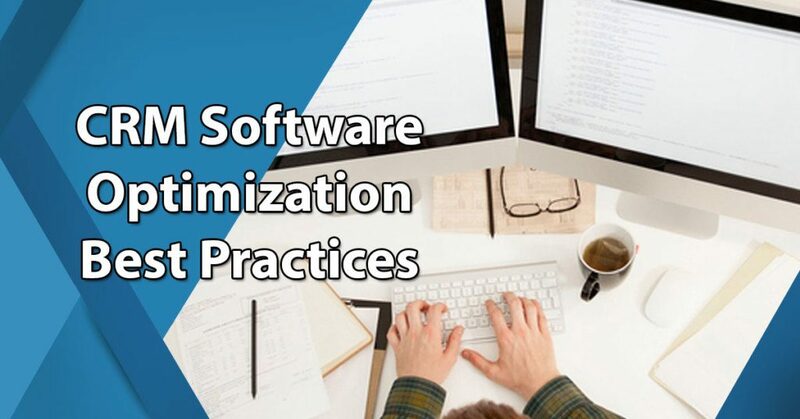 Based on realms of research and decades of experience, there are some well advised best practices to help you improve your CRM software utilization and get more payback from your software investment. CRM optimization efforts can easily drive your company over a cliff if there is no one there to steer the imitative. Make one person ultimately accountable for CRM optimizations and results. Preferably this person is someone who understands the company's most significant business goals and processes more so than someone who understands technology. Of course CRM improvements require technical support but it should be a business leader that designs and drives refinements and upgrades. Customer Relationship Management software and strategy touch several lines of business. Without a central leader, departmental conflicts and sub-optimization can creep into customer facing processes thereby degrading overall business performance and alienating customers. Traditional CRM focuses on products, sales and other company activities. More modern Customer Relationship Management focuses on the customer lifecycle. Your goal is to move from a reactive state to a proactive one in your interactions with customers. Or said differently, you'll acquire and retain far more customers if you advance from a product company to a customer company. To do this, you need to consider, design and implement customer facing processes not just from the company's perspective, but also from the customers' perspectives. Ensure every software optimization adheres to this goal. Aim for a seamless and consistent customer experience with each enhancement and customization. Although automating business processes aids a company in its operations the key focus of CRM should be to always remain customer centric. Far too few companies begin their implementation process with a solid change management plan in place. Even fewer remember to update their change management process to keep it in sync with periodic optimization adjustments. It is important to remember that customer relationships don’t just happen or advance by themselves. Nor can you put a technology in place that can maintain these relationships without any human interaction from your side of the equation. CRM enables relationships; it does not and cannot form relationships of its own accord. That includes relationships inside your own company. Rigorous and timely updates to your change management plan will help ensure your own people embrace and advance your CRM efforts and progress. If there is insufficient buy-in from the top down in your organization, efforts will erode and eventually fail. Furthermore, that buy-in must remain strong long past the initial fascination with the new tool. Buy-in can fade over time particularly if the CRM system becomes stale and less and less useful as the days go by. Your change management process is your best defense against this deterioration of interest and usefulness. Be sure to keep your change management process updated and meet periodically with your staff to ensure that the changes made (or planned) fit users’ needs. Forklift changes in particular need a staff preparation period before launch but do not assume smaller changes need little to no introduction or follow-up. After launch, plan on meeting with affected users to solicit their input and refinement suggestions. Then communicate with users again after the improvements are in place. Continue this process with every feature launch and optimization cycle. Part of your change management should include scheduled tiered-training. This simply means that there is one level of training for new employees that need to learn the CRM system from scratch and another tier for more advanced users who merely require an update on new features and functions. Such an approach ensures users stay abreast of changes, understand how and why to use them, and have an opportunity to express frustrations and approvals of the various CRM capabilities. A one-size-fits-all approach to training that combines both new users with experienced users will invariably fail.